Please contact me with further information about Secondary Standing Orders. Please enrol our school to receive the Secondary Comprehensive Subscription (includes notable international titles and middle grade international fiction).Please send an invoice for $1,220.00. 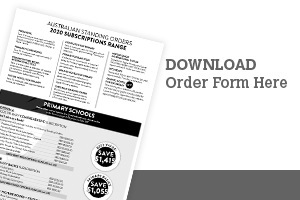 Please enrol our school to receive the Secondary Subscription. Please send an invoice for $995.00. Please enrol our school to receive the Middle Grade International Fiction Subscription. Please send an invoice for $225.00.